In my Instapaper guide I made the case that $30 a year was a small price to pay for the vast increase in productivity I enjoyed. It’s not the first time I’ve enthusiastically gushed over how much I love this small utility disguised as an app, just as I’m certain it won’t be my last! In both instances I manage to find different aspects to highlight. Don’t let the seemingly simple appearance of Instapaper fool you into thinking that it isn’t backed up by a robust, surprisingly complex and sophisticated engine. If you know me even a little it will come as no surprise that my favorite Instapaper feature, the one that I use daily, is the Playlist feature. I use it to accumulate all my reading material for the day(s) and then have everything read out loud to me at 1.5 speed or even double speed. Sometimes I may slow things down to .5 speed though if it’s really complex material or if I really need to focus! My video isn’t really great. In fact it goes by so quickly that you may need to watch it a couple of times to pickup the steps. That’s because I never really intended on making a video. It was a spur of the moment decision one day when I added the Google Photo app to an iPad, and I discovered (really rediscovered) the automatic video making feature contained within. I’d been thinking of writing a brief ‘How To’ post on the subject and had even made a few screenshots when I happened upon this cool video maker utility once again. I love anything automatic and anything that will save me time! So I loaded my screenshots into the app and let Google Photos do its thing. The ensuing video wasn’t great…but there weren’t really any editing tools for improving it. So I loaded the end product into the iMovie app, tried to slow it down as much as possible…which wasn’t a lot…and cleaned up a few things. Then decided to upload it to YouTube despite its lack of greatness, because I’m trying to build an income stream from my YouTube channel. (It’s slow going but I made major headway this year!) I was thinking that no one would ever actually watch it. But they did! Naturally I’d used up all of the time that I’d have needed to actually write the ‘How To’ post…so the Google auto movie maker really didn’t save me much time at all. I write an apology for its lack of quality anytime I share it with anyone. Overtime however I’ve come to realize that the video does indeed run through all the steps well enough to get the gist of it. It just does so really quickly. So you may be forced to watch it more than once if you don’t act quickly and pause it on some of the screens. But really, the Playlist Feature is so easy that you really don’t even need my video…except for one tiny thing. The one aspect that’s tricky is figuring out what to do after you’ve selected all you articles for your playlist. That was the part that I couldn’t figure out myself…and it’s why I thought that other’s may be frustrated too. I searched high and low for an answer and couldn’t find one. I don’t remember where I did find it in the end…but even that is really easy if you just know where to look. So, the trick is to look at the bottom of the screen…it’s not a natural place to look in Instapaper’s app because all the other functions and menu items are located somewhere at the top. But if you look closely you’ll see that the word ‘Playlist’ appears in the center bottom of the screen. If you tap on it, all the articles in your queue will begin to play, one after another….with a nice sounding sort of musical note played between them so if you’re driving or doing something where you really need it to operate ‘hands free’ you’ll know exactly when reading moves on to the next article in the list. Initially all the articles will appear in list form as the app begins reading to you. You can easily tell which article it’s on. But if you’d like to follow along even closer just tap on the article that’s active and it will open to display the article and you’ll see the cursor moving across the page…so you’ll always know exactly where you are if that’s important. You can instantly stop the reading momentarily to highlight something or even copy some text that you can then save to a note app or share to a social networking site. 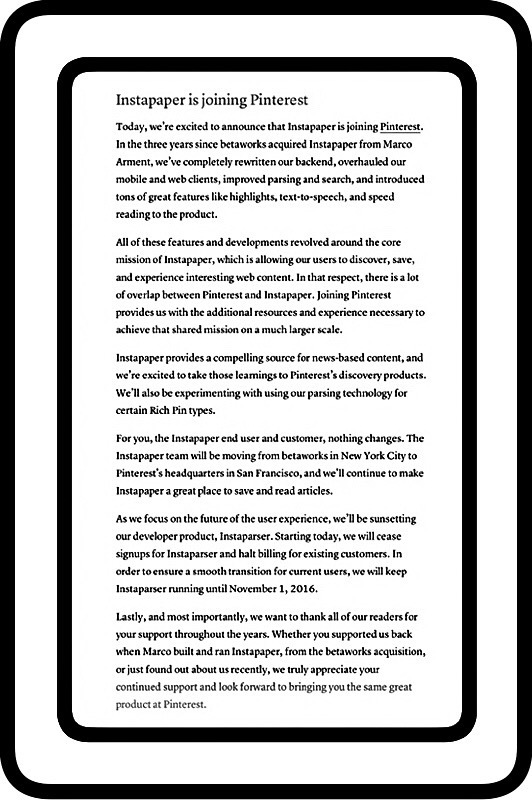 Instapaper never loses its place. You can actually leave the app and go on to do other work on your device if your able to concentrate while it’s reading to you. The only way Instapaper will stop reading is if you physically stop it by X’ing out of it. If an article gets boring or there’s some extraneous text that made it through, you can advance the reading by stopping and just tapping where you’d like it to pick up again. Perhaps what I love most is that you can even place your tablet into sleep mode and continue having Instapaper read to you. So, very little battery power is used on your device. One of the 1st times I tried this out was when I was driving at night following a number of days packing up a household of furniture and items to move. I was exhausted by the time we hit the road and it was beginning to get dark. I dreaded the 4-5 hours of driving ahead of me. But the time flew by as I listened to a lot of things I’d not had the time to read. After I arrived at my destination I discovered that my new phone, the iPhone 6+, had only used around 10% of its battery! And the volume was so loud that I didn’t even have to set it to the phone’s highest setting. It also didn’t matter that I hadn’t gotten around to hooking up my new phone to the car speakers with Bluetooth yet. I was easily able to drive, stay awake, and even pause it to talk on the phone several times. I was surprised to find so many negative reactions to the news…really surprised frankly. But then I realized that most were from people who really love the app and use it as much as I do…if not more if that’s even possible. They just generally seem worried that changes may arise due to the new ownership. Changes which may negatively impact their own workflow or have other unforeseen or negative consequences. Because (let’s face it) most people really don’t like change! Even those among us who are tech minded…human nature dictates that we get stuck in our habits just like everyone else (although maybe we tend to hide that tendency a little better!) It’s moments like these when we can’t help but reveal our true colors…causing me to wonder just a little how receptive our industry as a whole has been to the recent election results! From my perspective, while I’m not a huge Pinterest fan, I recognize that having greater resources backing up the Instapaper dev team can only lead to greater freedoms…allowing them to focus more on the product (which runs contrary to ‘others’ opinions*’ and I really don’t believe!) Better yet, perhaps this will allow even greater things to come in the future! 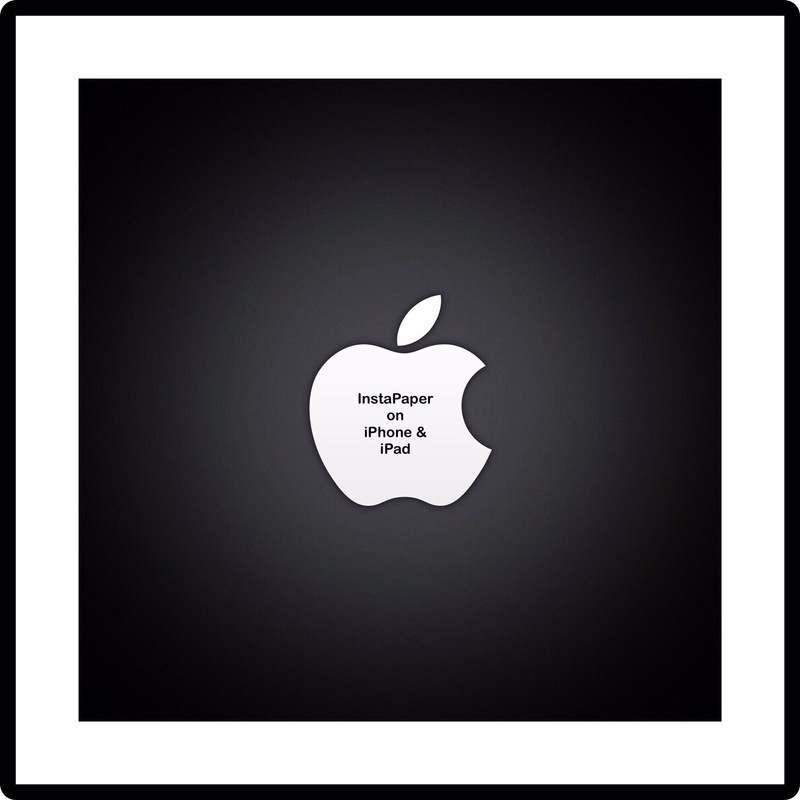 *Comments made to Instapaper’s big news. You’ll notice at the top of this announcement that there are 76 comments. If you tap on the word comments they’ll display and you can read people’s somewhat surprising concerns and negative reactions to this great news. 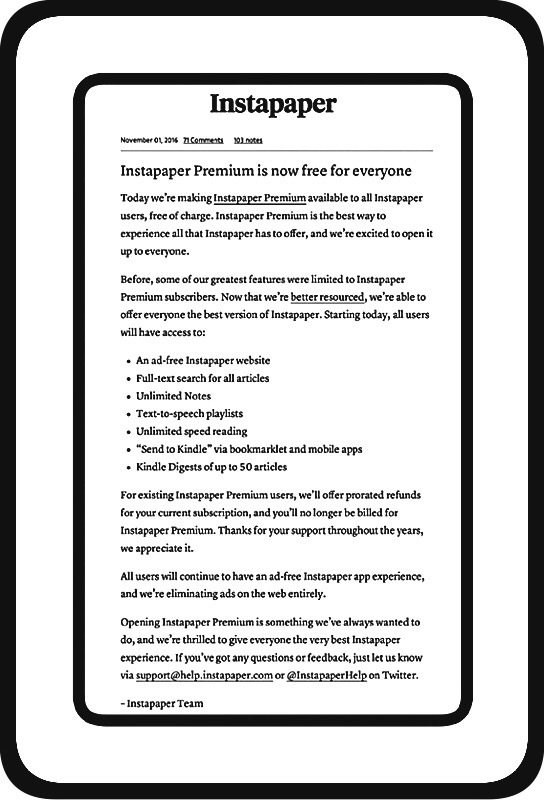 Prorated refunds to Premium users and free premium features for everyone is a great start in that direction I think! If you haven’t done so already and if you’ve ever considered checking out Instapaper…now is the time. You’ll find it extraordinarily useful if you tend to read a lot of current news articles from online sources like Twitter and Facebook, and if you can’t find enough hours in your day to get things done. This entry was posted in ios apps, Productivity, Tech Tips and tagged Instapaper, Instapaper free, Pinterest buys Instapaper. Bookmark the permalink. 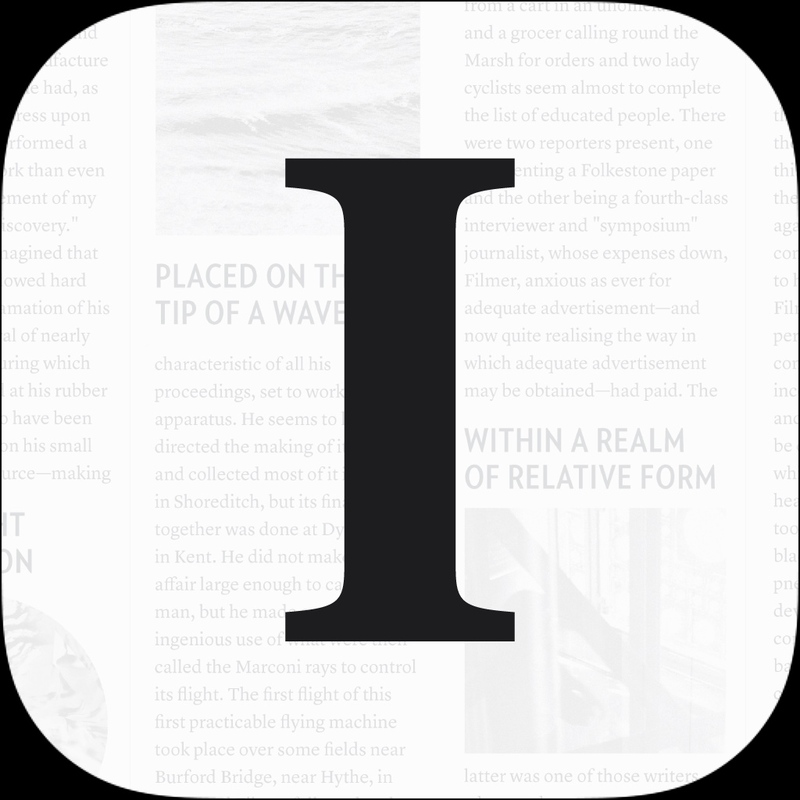 3 Responses to Instapaper Is Free! Sorry it took so long to reply…your comment ended up in a spam filter and I just found it. The web clipper looks really nice. I use Evernote’s, but sometimes a standalone one would be handy. Is there are ios version of this? It gets great reviews! Hi,Thanks for visiting! That looks interesting and I’ll check it out more when I have occasion to.